Britain’s referendum decision to exit from the European Union (EU) is likely to have an overarching impact on the M&E industry beyond just the United Kingdom (UK) and the EU. With most media organizations already struggling to meet the increasing demands of the ‘Digital Next’ consumer, Brexit with all its complexities is only expected to exacerbate existing problems. As uncertainty looms large over the UK economy,questions about the future of content funding arrangements, data portability, movement of people and services, copyright law, and change in regulations are rife in the minds of M&E players. One of the major reasons for concern is that UK is a major content creator for Europe. The export of UK’s TV shows and formats to European broadcasters is pegged at around £376m a year*,and many fear that this figure will drop when the country breaks ties with the EU, affecting revenues and in turn jobs. As witnessed in earlier recessions, while consumers may continue to spend on connectivity, they are likely to cut back on paid-for content, both linear and digital. This could impact pay-TV and streaming subscriptions such as Sky, Amazon and Netflix.As consumer spending shrinks, advertisers will be scrutinizing the return on their investments even more closely. Free-to-air broadcasters like ITV, Channel 4 and Channel 5, who derive much of their revenue from advertising, would be the worst hit. BREXIT’s impact on M&E industry from Prime Focus Technologies on Vimeo. With new tariffs, taxes, permits and territorial licensing regulations coming into play, Brexit may make it more difficult for UK enterprises to access the full scope of European talent and technology. Restrictions on the movement of cast and crew as well as physical goods such as DVDs are all possibilities, and these changes may increase production costs for UK’s content creators. As currencies fluctuate in the wake of Brexit, production budgets could take huge hits, and a weaker pound will affect the amount that British broadcasters will be able to pay in dollars or euros to acquire content produced abroad. Brexit might also mean that UK will no longer be a part of the European Union’s Digital Single Market, and will not have much – if any – say in drafting and reviewing regulations that impact the M&E industry. Additionally, UK may no longer be able to receive funding from the European Union’s Media Program, which supplied as much as $45mn in 2014 and 2015. The EU also has strict content quotas in place for how much EU-created content is aired. Once the UK officially leaves the EU, they will no longer be part of that calculation. This could limit the number of distribution deals that UK content creators can strike with European networks. Moreover, international TV networks whose channels are uplinked from European headquarters in the UK will no longer be covered by the EU’s Audiovisual Media Services Directive, which may prompt relocation to a European Union country. 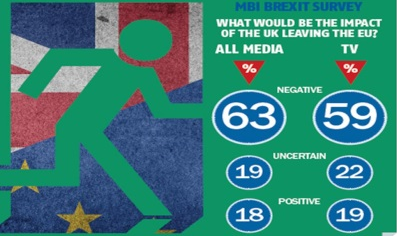 According to a recent survey by Media Business Insight (MBI), 59% of producers, broadcasters and distributors think Brexit would have a negative impact ontheir business. 22% said they were uncertain what Brexit would mean for the UK broadcasting industry, and 19% said leaving the EU would be positive for the sector. Though the precise outcome of Brexit is difficult to predict, it is clear that the next few years will be mired in uncertainty. Much will depend on the final terms of Brexit, and until a clearer picture unfolds, the best thing M&E enterprises can do is focus on implementing strategies that help reduce cost and increase monetization. Technology like the Cloud, which is future-ready and boundary-less, can help companies function virtually, and create more local content at a lower cost, thus helping achieve business goals. CLEAR™, PFT’s award-winning Hybrid Cloud technology enabled Media ERP platform helps drive creative enablement, enhance ecosystem efficiencies, reduce cost and realize new monetization opportunities.